Tucked away from the road in a prime location on scenic Lakeshore Drive, this home is a short distance from historic downtown Mount Dora. 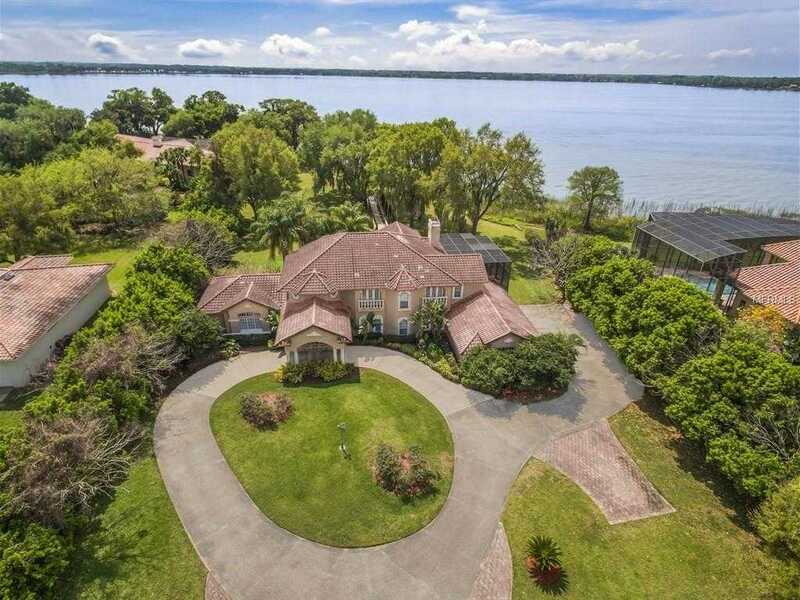 A private gated entry and tree-lined driveway meanders to this exceptional custom-built one-owner home set amid 2.35 acres and 330 feet of direct frontage on Lake Dora, the crown jewel on the Chain of Lakes. Prime waterfront setting featuring walls of glass and a front-row seat to nature 8217;s wonders and spectacular views into every waking moment. 5316 square feet of living area with formal living and dining room, family room with wood burning fireplace, office and pub bar. Two staircases ascend to the second level with two bedrooms, bath and a large loft with two studies, living area and private balcony overlooking the waterfront. The center island kitchen features a separate prep kitchen, granite countertops, custom cabinetry by Southwest kitchens in Winter Park and stainless steel appliances including three ovens. French doors open to expansive outdoor living areas including a glass and screen enclosed lanai and huge outdoor patio for the ultimate grand scale entertaining. Built with a reverence for luxury by Jones Clayton including marble floors with decorative inlays, intricate ceilings, Italian tile, crown molding and built-ins. Room to build a separate dwelling on the property. Please, send me more information on this property: MLS# O5755097 – $1,350,000 – 3520 Lakeshore Dr, Mount Dora, FL 32757. I would like to schedule a private showing for this property: MLS# O5755097 – $1,350,000 – 3520 Lakeshore Dr, Mount Dora, FL 32757.